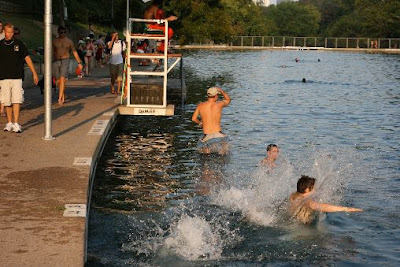 Barton Springs is an item on the August Summer Fun Checklist and the perfect place to cool off on a hot summer day. Some people are a bit intimidated by the 68- to 70-degree water, and you will observe shouts and squeals as swimmers take the plunge. But, whether you prefer to inch your way down the steps or to cannonball in, you will emerge from the water rejuvenated and a little more comfortable in the 100-degree heat outside. 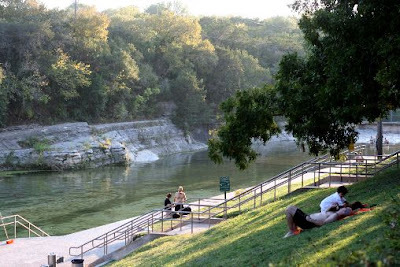 The three-acre Barton Springs provides all the amenities of a city pool combined with the beauty of being out in nature. There are lifeguards, changing rooms with lockers (bring your own lock) and showers, concrete walkways, a diving board, regularly placed ladders and steps at the edges, and the pool is deep cleaned at least weekly. The pool bottom is natural rock with plant growth. 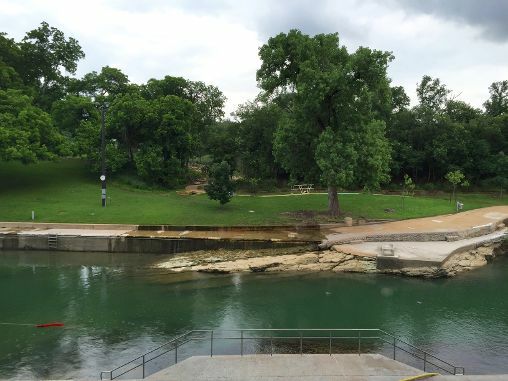 You might even spot the endangered Barton Springs salamander hanging out in this federally protected habitat. The banks of the pool are mowed lawn, with plenty of trees creating shady spots to lay your towel and people watch. The deep end extends to 18 feet. The shallow end is great for children to explore. 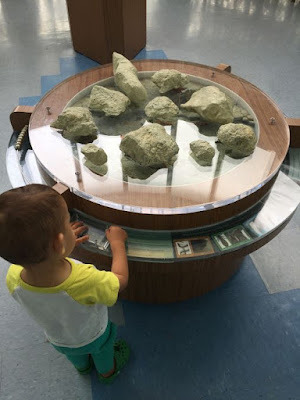 It begins with rock and gently slopes into water. The rocks can get slippery, so water shoes are highly recommended. If you want a break from the outdoors, you can pop into the free Splash! Exhibit. The entrance is outside of the actual springs and can be visited even on days when the pool is closed. 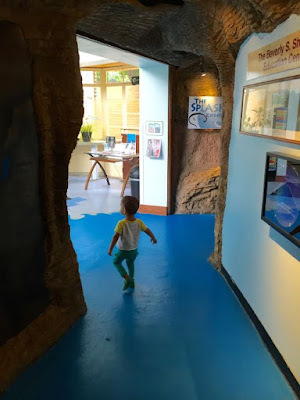 In this kid-friendly space, you can learn more about the history and biology of the springs, and walk through a cave to view the Living Springs documentary. There are two entrances to the pool, both open daily. 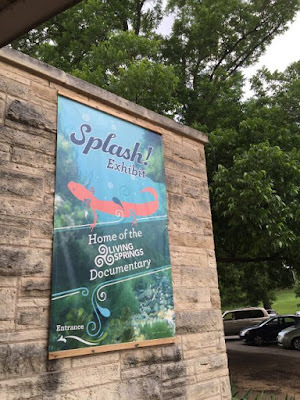 The main entrance is 2201 Barton Springs Road. The South Gate entrance is off Robert E. Lee Drive (from the Barton Springs intersection, drive south on Robert E. Lee past the ball fields). The South Gate entrance closes daily at 9 p.m., while the main entrance is open until 10 p.m.
Free Swim without a lifeguard is 5–8 a.m. and 9–10 p.m.
Bring cash! While there are now two ticket kiosks at the entrance where you can use a credit card, these were both out of order when I visited. Also, both the weekend parking fees and the nearby Zilker Zephyr train ride are cash only. If you will be visiting the springs regularly, consider a punch card. At $34, you get a $6 overall discount, they don’t have an expiration date, and they can be used at any City of Austin swimming pool. Prohibited Items/Activities at the springs: coolers, ice chests, thermal bags, food, smoking, glass, alcohol, Frisbees, footballs, soccer balls or other hard balls, drinks that are not in a plastic resealable container with a twist-off lid. 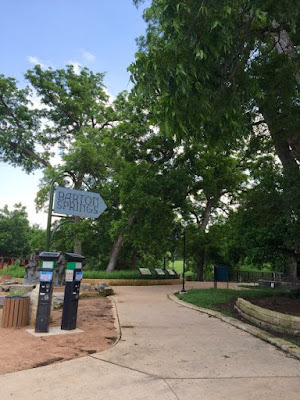 (If you want to picnic, Zilker Park has many areas with picnic tables and the Zilker Café is right next to the Barton Springs entrance). 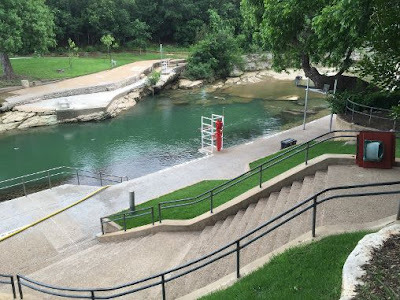 Contact their hotline at (512) 867-3080 or visit their website (https://austintexas.gov/department/barton-springs-pool ) for up-to-date information. About the author: Alison Fader-Brock has lived in Austin, Texas, for over 10 years. She came here on a whim from the East Coast, and Barton Springs, the breakfast tacos and great people have kept her happily here. She was inspired by her work at a criminal defense firm to earn her Masters of Science in Social Work at UT Austin. She has worked mainly with adolescents in school-based settings. She currently spends much of her time exploring Austin with her kiddo.